LAS VEGAS, Jan. 4, 2017 /PRNewswire/ -- (International CES) -- Epson, the number-one selling projector brand worldwide, today introduced its slimmest ultra-portable projectors to date – the next- generation PowerLite 1700-Series. The PowerLite 1795F, 1785W, 1781W, and 1780W offer a convenient form factor ideal for business travel, wireless connectivity for quick and easy content sharing, and flexible positioning with automatic vertical keystone correction for proportional, high quality display from multiple angles. The two high-end models also offer wireless screen mirroring from a smartphone or streaming device1 with Miracast for optimized connectivity options. Epson projectors feature 3LCD, 3-chip technology for 3x Higher Color Brightness2 and up to 3x Wider Color Gamut3 than competitive DLP projectors. All new PowerLite 1700-Series projectors support Chromecast™, Roku® and MHL-enabled devices. The PowerLite 1780W, 1781W and 1785W offer WXGA resolution, and the flagship PowerLite 1795F features 1080p resolution for Full HD-quality content. In addition to auto vertical keystone correction, the PowerLite 1781W, 1785W and 1795F offer auto horizontal keystone correction and Screen Fit to quickly adjust an image to fit any screen, even if the projector is placed off center. 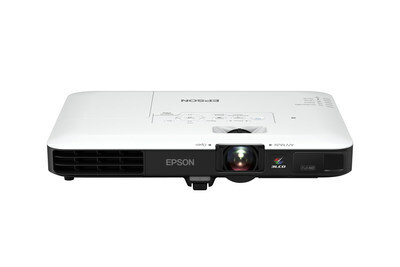 "Thin as a laptop and just four pounds, the PowerLite 1700-Series are lightweight and wireless projectors, ideal for road warriors that require bright images, optimized connectivity and HD quality presentations," said Eric Uaje, product manager, Projectors, Epson America, Inc. "The integration of 1080p resolution, vertical and horizontal auto keystone correction and flexible projection from mobile devices were a direct result of feedback from our customers, and we will continue to deliver the innovation customers need to aid in their business success." The PowerLite 1781W ($799 MSRP) projector will be sold through authorized retailers, and the PowerLite 1780W ($749 MSRP), 1785W ($1,099 MSRP) and 1795F ($1,249 MSRP) projectors will be sold through authorized Epson resellers. All PowerLite products come with a two-year limited warranty and a 90-day limited lamp warranty, with next business day5 replacement to the U.S. or Canada, free of charge and arriving with a postage-paid return shipping label. For additional information, visit www.epson.com/projectors. 1 For wireless functionality, including via the Epson iProjection App, the projector must be configured on a network, either through the Ethernet port on the projector (check model specifications for availability) or via a wireless connection. Check your owner's manual to determine if a wireless LAN module must be purchased separately to enable a wireless connection. Not all Epson projectors are able to be networked. The Epson iProjection App does not support all files and formats. See www.epson.com for details. 2 Color brightness (color light output) measured in accordance with IDMS 15.4. Color brightness will vary depending on usage conditions. The projectors used by a third-party lab for measuring color brightness were leading 3LCD projectors and leading 1-chip DLP projectors, based on NPD sales data for June 2013 through May 2014 and PMA Research sales data for Q1 through Q3 2013. 3 Gamut volume of leading Epson business and education projectors compared to leading 1-chip DLP projectors, based on NPD data for June 2013 through May 2014. Volume is measured in 3D in the CIE L*a*b* coordinate space. Note: EPSON and Instant Off are registered trademarks, EPSON Exceed Your Vision is a registered logomark and Epson iProjection is a trademark of Seiko Epson Corporation. All other product brand names are trademarks and/or registered trademarks of their respective companies. Epson disclaims any and all rights in these marks.